River Studios is home to our fresh new and updated Pop Academy, with a more modern approach and opportunity to experience working with industry professionals. The South’s leading recording studio is proud to offer young people ages 4-21 the opportunity to join our exciting new Pop Academy. Our classes encourage participates to work as a team and build confidence to learn new skills individually, as well as in group performances. All of this, whilst working towards regular onstage and offstage productions. Our friendly classes run TERM TIME and out of school hours. Students are split into smaller groups dependent on age so that we can give every person the attention they deserve. Each group runs in 12-week blocks and will work towards a parent presentation at the end of each term. Developing confidence, physical awareness, communication, as well as being educational and lots of fun! Students should be prepared for Registration, Uniform, regular attendance and the occasional homework. We all know a budding performer or little pop star in the making, could your child do with a little encouragement when it comes to their confidence and self-esteem? Our two-week trial allows your child to experience our Academy first hand, before committing to the whole term. 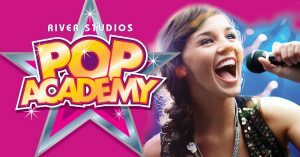 Our creative and experienced team will give you the chance to discover POP ACADEMY in a safe and relaxed environment. Students will attend 2 weeks as a trial and then take part in weekly sessions for the rest of the term, held on a Sunday. We look forward to welcoming you to our Academy!